Photograph courtesy of Our Heroes, South Dublin Libraries and David Power. Gilbert Stewart, though still an integral part of the family, was no longer at Clough as many of these events unfolded – farming was not for him. He trained as a doctor and sought a career with the military. He was a Surgeon-Lieutenant by the 30 January 1892, a Surgeon-Captain by the 30 January 1895. The emergence of the Royal Army Medical Corps allowed Captain Crawford to become Major Crawford in January 1904 and to advance to the rank of Lieutenant Colonel on the 8 August 1914. By then he had already had an exciting career and remarkable record of service. Wellcome Library (http://wellcomelibrary.org) - RAMC/1118:Box 228, Reference Number b18302920. Used under Creative Commons, Attribution, Non-commercial license. Crawford served on the North–West Frontier Campaign in India (1897-98) - India, Pakistan and Bangladesh were all part of India at the time - with the Tirah Expeditionary Force, a posting which gained him a campaign medal and two clasps. While it is not relevant here to discuss the causes of this war or indeed the course of the fighting, it is worth reading some material from the introduction to the ‘The Indian Frontier War, Being an account of the Mohmund and Tirah Expeditions 1897, by Lionel James, Reuter’s Special Correspondent, published London, William Heinemann, 1898, a book that should have been compulsory reading for all those who advocated intervention in Afghanistan and the tribal areas of Pakistan in more recent times. ‘He was given a conjectural map of the theatre of war, and was led to understand that no small part of his duty was a fairly accurate survey of the unknown country. He had ... as fine a body of fighting men as could be found ..., but with this army he had to carry a larger army of non-combatants and followers, and a multitude of transport animals ... no fewer than 43,810 transport animals.... This was ... in addition to the transport of the Peshawar and Kurram columns ... it had to be protected, and pushed and driven through perhaps the most difficult country in the world! General Lockhart was called upon to take this undisciplined multitude across mountains where there was not even a vestige of a goat-track; along river-beds strewn with boulders, where the only path was knee-deep in icy water; through gorges where two animals abreast closed the up gradients which in their initial stages defeated (and this is a hard saying) even mountain battery mules; down descents which were almost precipices; through barren places where food there was none; and into extremes of climate which destroyed the weaklings and consequently increased the loads of the more robust. Even had there been no opposition, the passage through such a country of an army so handicapped would have been a great feat. The medical staff like Crawford worked in terrible conditions in this wilderness, yet they did well. ‘Few people, probably, outside the Department (i.e. Army Medical Services), have any conception of the strain and responsibility devolved on the Medical Services ... Twenty-three field hospitals altogether were mobilised. ... Each of these could accommodate 100 sick men, and was fully equipped with supplies and comforts for three months. In addition, base hospitals were formed at Rawalpindi, Nowshera, and Kohat, in which beds were provided for upwards of 3000 men. These figures will give some idea of the scale of the organisation. But the wild, roadless country in which the operations were conducted enormously increased the difficulties ... in making arrangements for the care and treatment and transport of the wounded and sick. From Bagh in Tirah to the advanced base at Shinauri is about thirty-five miles by a track traversable only by mules and ponies, or on foot. For these thirty-five miles those who were too ill or too weak to ride, and there were hundreds such, had to be carried in doolies (palanquins) and stretchers, and strongly escorted all the way, for the road throughout was in hostile territory, except the last few miles. From Shinauri wheeled ambulances were available for seventy-five miles, until the railway was reached at Khusalgarh, whence it was a run of eighty miles to Rawalpindi. It may easily be believed that the work of carrying the wounded, and transporting them to the base hospitals, was a very real difficulty. There were no Chinooks! The condition of the wounded men must have been made worse by such a journey, their wounds made harder to treat. (The Campaign in the Tirah, 1897-1898: An Account of the Expedition against the Orakzais and Afridis under General Sir William Lockhart, GCB, KCSI, by Colonel H D Hutchinson, page 245-246). The South African War, 1900-1902, gave Crawford’s next opportunity to practice his medicine and gain experience. He was present at the Relief of Ladysmith, the Battle of Spion Kop, the actions at Vaal Kranz of the 5-7 February 1900, Tugela Heights from the 14-27 February 1900 and the action at Pieter’s [Peter’s] Hill. He was involved in operations in Natal, March –June 1900, including the action at Laing’s Nek on the 6-9 June. He participated in operation in the Transvaal in 1901. He acquired a Queen’s Medal and 4 clasps and a King’s Medal (Queen Victoria died in 1901) and 3 clasps. Photograph from Album of photographs of Boer War battlefields: Wellcome Library. Used under Creative Commons, Attribution, Non-commercial license terms. About 22,000 soldiers were treated for battle wounds. 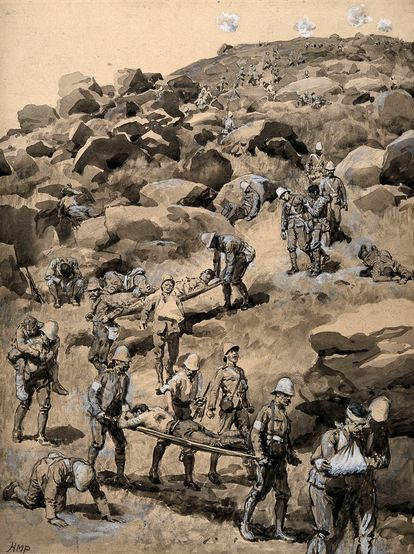 During the early phase of the war, most medical recovery teams, suitably identified, would enter the battlefield and to recover wounded men, but the Boers allegedly took advantage and squads were formed to fire on them, a procedure that killed soldiers and paramedics. This meant recovery was thereafter conducted after dusk, and this made medical care not just more difficult but also less effective. Despite that, however, the surgical care provision was vastly more effective than in previous wars. There were twenty-eight field ambulances, five stationary hospitals and 16 general hospitals established to deal with casualties and numerous voluntary organizations developed additional medical facilities. Special units of Natal Indian South Africans served in the recovery effort by transporting the wounded from battlefields. Based loosely on Lee, Emanoel (1985), "To the Bitter End: A Photographic History of the Boer War 1899–1902", London: Penguin Books, Viking Penguin Incorporated. Where the British climbed Spion Kop. They were to lose 1,750 men killed and wounded before the action ended. The Boer War created an opportunity for Crawford and other medics to promote a number of medical advancements. It was the first conflict to use waterproofed sterile gauze pads and safety pins. High power bullet wounds damaged bones and they developed splints made from canvas and made rigid by bamboo strips. These they covered by Plaster of Paris to create casts. X-rays were also utilized widely for the first time, though some x-ray machines were used earlier, e.g. at the time if the Tirah Expedition. 'Boer War: removing the wounded after battle. Crawford was to take his experience of India and South Africa to the Great War, but also other experiences that resulted from his sojourn in the Mediterranean. He became Major Crawford, Royal Army Medical Corps, on the 30 Jan 1904 and arrived in Malta in February 1906. He was in charge Mtarfa Military Hospital in July 1906 and he introduced measures to lower the mortality from infantile enteritis. He assisted with sanitary matters in Malta after Sept 1907, and was appointed Sanitary Officer for Valletta in 1908. He returned to England on leave in June 1908 but after the 28 Dec 1908 he found himself in charge of a medical party sent to Sicily following the earthquake at Catona. The 1908 earthquake was the first ‘national’ catastrophe Italy had to face since recent unification. Both Messina and Reggio Calabria were almost completely razed by the earthquake beneath the Messina Strait. It occurred on the 28 December 1908 at exactly 5:21 am while everyone was sleeping, and lasted a mere 30-40 seconds. It measured about 7.1-7.5 on the Richter scale. Ten minutes after the catastrophic earthquake those who tried to escape by running towards the open spaces of the coast were engulfed by a 40 foot high tsunami that swept away the whole seafront. It is estimated that 25,000 people perished in Reggio Calabria and 65,000 in Messina. Reggio lost 27% of its inhabitants; Messina lost 42%. The violence of the earthquake meant it was felt in Malta too. The Daily Malta Chronicle reported that, "The seismograph at the university (of Malta) was thrown out of gear by the violence of its (the earthquake's) own action." "We were cut off from the world. All the wires were down. We could not see the lights of Reggio, which told of destruction. All things seemed to be returning to savagery. Early Tuesday morning we saw some silent gray monsters tearing up the Straits, and we could soon distinguish the white ensign. The British fleet had come. It brought the first help from the outside world. It brought surgeons, medical appliances, food and clothing. As soon as the sailors landed they began to restore order." The work the unit did there was much appreciated, though they were only one of the major relief teams that sped to the area. Crawford and the many others of the British team returned to Malta in 1909 and he was to remain there as Sanitary Officer Valletta until March 1911. On the 29 Oct 1909, he was appointed Commander of the Crown of Italy, a reward for his services in Calabria during the earthquake crisis; he also received the Silver Medal and Diploma of the Italian Red Cross. This was bestowed upon him by the Governor and Commander in Chief at the Palace Valletta. He became a Lieutenant Colonel on the eve of the Great War and he was in command of the 14th Field Ambulance from mobilisation until August 1915, and was through some of the heaviest fighting on the western front, frequently carrying out his work under heavy shellfire. Details of his character and work are hard to obtain but some insight can be gleaned from With the French in France and Flanders, Being the Experiences of a Chaplain attached to a Field Ambulance, by Owen Spencer Watkins, Chaplain to the Forces. Watkins was, according to his book, with the 14th Field Ambulance during the Retreat from Mons, at Le Cateau, the Battle of the Marne, the Battle of the Aisne, with them when they retired from Aisne to Northern France and with them at the holding of the Bethune-Arras-La Bassee Line, during the blocking of the road to Calais and at the First Battle of Ypres and Armentieres. Watkins was a Methodist minister and was delighted to find that ‘The Officer Commanding the Field Ambulance was ... Lieutenant-Colonel G S Crawford, a member a family which ... has rendered such fine service to Irish Methodism, and whose sympathies were, I speedily discovered, with me in the work that I was sent to do. (Page 12)’. Major Francis Graham Richard had been killed, Chaplain D P Winnifrith was invalided, Captain Bell and Lieutenants Martin-Row and Clarke were wounded, as indeed was the Reverend Watkins, but Crawford, as a favour to a friend, let him recover with the unit in France. 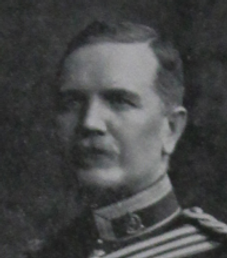 Crawford later commanded the 18th Stationary Hospital, Mediterranean Expeditionary Force for a time. No 18 Stationary Hospital opened at West Mudros on Lemnos in August 1915 with 624 beds and it later expanded to 1,340 beds. The Greek island of Lemnos, situated in the northern Aegean Sea at about 50 miles from Turkey and the Dardanelles, and it was used as a staging post for the assembly of troops and ships to be used in the Gallipoli campaign. More importantly for our current study is its role as a place where the wounded of Gallipoli were treated by people including Crawford. Given the nature of the harsh terrain and the narrow strip of land that the Allied troops held on the Dardanelles peninsula, treating and caring for the wounded close to the front was not possible and hence the men had to be evacuated on flat-bottom boats and then transferred to hospital ships waiting offshore for transportation to hospitals in Egypt and Malta. Even that was difficult, as Sir Ian Hamilton's noted in his despatch of May 1915. The close proximity of Lemnos was attractive, but the island lacked suitable medical facilities, so was intended initially to deal with the slightly wounded, i.e. those likely to be well within twenty-eight days. But the sheer numbers of wounded from the early August offensive and the flood of sick that followed in late August, September and October necessitated its development as an intermediate military medical base. Crawford was one of those who did that work and, though details of his personal role are unavailable, we know he was instrumental in the transition. The hospital moved to Egypt in January 1916, and he probably went with them. The rest of his career in the Great War is not known to us at this time and he may have retired before the war’s end. He was mentioned in despatches, by Field-Marshal Viscount French, and on the basis of his excellent service he was appointed a Companion of the Order of St. Michael and St. George. His name was removed from the Reserve of Officers in May 1923. He inspired his nephews, the sons of his brother Robert of Ashville, Galgorm Road, Ballymena, to enlist. Cadet Robert (Rollie) Crawford joined the Royal Irish Rifles via a commission in the 18th Battalion of the Royal Irish Rifles. 2nd Lt. Rollie Crawford was educated at the Model School Ballymena Academy, Foyle College and Trinity College, Dublin where he was studying for the ministry. In the early spring of 1915 he had joined the Royal Irish Rifles as a private and later became attached to the cadet corps, from which he gained his commission. He went to the front during the first week of February 1915. His brother, 2nd Lt. Jack Crawford, Royal Irish Rifles, was wounded in the Ulster Division's Somme advance in July 1916. The Ballymena Observer said, ‘We understand that he is in hospital in France and is progressing favourably from his wounds which he states himself are only slight. Mr. Crawford who is just 21 years of age, was with the YCVs (Young Citizens Volunteers).’ Both brothers survived the war. Lieutenant Colonel Gilbert Stewart Crawford, MD, CMG died on the 2 November 1953 at Exmouth, Devon. He had been an outstanding medic and organiser, a man who made a great difference to the lives of others, military and civilian. Sadly he is scarcely remembered in his own home locality. To the Bitter End: A Photographic History of the Boer War 1899–1902, Lee, Emanoel (1985), London: Penguin Books, Viking Penguin Incorporated. With the French in France and Flanders, Being the Experiences of a Chaplain attached to a Field Ambulance, by Owen Spencer Watkins, Chaplain to the Forces, published London 1915 by Charles H Kelly, 25-35 City Road, and 26 Paternoster Row, E.C.